For those of you who are unaware of my hobbies, one of them is to collect STAR WARS and STAR TREK action figures and other toys and has been for many years now. When I was a litte kid I collected most of the original STAR WARS action figures made by Kenner between 1978 and 1985 and still own them, and I started collecting the new Kenner/Hasbro figures starting in 1998. Over the past 13 or 14 years I've probably acquired well over 2,000 action figures of different sizes and from different lines. I've posted quite a few pics of my collection in the "Picture Post" thread in recent months and also have a Photobucket account full of snapshots of my stuff. In addition to all my STAR WARS stuff I also own a much, much smaller but nonetheless quality collection of STAR TREK figures, dolls and plastic and die-cast ships dating back to some of the classic Mego (TOS) dolls of the '70s and the 3-3/4" line of action figures from THE MOTION PICTURE that were in stores in 1979 and 1980. Does anyone else here collect action figures, toys, dolls, etc.? Feel free to discuss your hobby and post pictures of your stashes...I'd love to see what you guys and gals like to collect! Let's get this ball rolling! i don't collect as much as i use to. i had most of the Star Wars stuff starting with the 98 Powers of the Force line. kept collecting till Episode III came out. around that time i sold most of my older figures and began to focus on Marvel and DC toys. yesterday i bought DC Universe Classics Gold, Mercury and Iron (three of the Metal Men). also got Orion earlier this week. last weekend i got Marvel Legends 'Bucky' Captain America. those Art Asylum Star Trek figures are really great. if only the 09 movie figures were made by Art Asylum. I collect TFs, but mostly the classics, a few third party versions and animated. I used to collect as a kid, mostly MOTU, TMNT, and Batman and Spider-Man figures. I have recently returned and have been impressed with how far the figures have come since I collected. The detail and articulation especially. I'm still waiting for the Art Aslyum/Diamond Select Enterprise-E to come out...it continually has been pushed back for the last year or so. I want my ship! The largest figure collection I have right now at all is a random assortment of Sonic the Hedgehog toys. You started this thread just for me, didn't you? It's been a bit since I've taken some pictures of my crap. Stuff's been updated since. Time to snap some more, I think. No, but I won't lie...you were one of the posters I had in mind. You seem to have a good grasp of the subject and I'd love your input. I love the Vintage range of Star Wars toys. I picked up a couple today. Which ones if you don't mind me asking? I have every Vintage Collection figure but two: the VC28 Wedge Antilles and the VC50 Han Solo(Bespin Outfit). I'm wondering if a new wave of Trek toys will hit the shelves when the new movie comes out? Will they be made by a new company, or will they change the design? ^I can only pray. The ones from the last film were just dreadful. I'd love Diamond Select to get the license back. LOL One was Wedge! I got him, Ponda Baba and a Hoth guy from Smyth's (UK toy shop). I hear Bespin Han is being re-released in a future wave. i collect RAH GI Joe and the UK cousin line Action Force. i'd say some toys will be made. also hope a new company gets the license. but man, i still find those 09 Trek toys at the clearance aisle on occasion. Here's my desk, such as it is right now. I change things around every so often. I'll take some pictures of the rest of my collection when I feel like it. Actually, it was announced that Hasbro got the license to make toys for TREK 2013. I'm glad. Hasbro has proven much more commercially competent and successful than Playmates and others who have tackled the TREK action figure lines in the past...and with all due respect to some of those other companies, they weren't able to make most of their figures and dolls look like the actors and characters. Some of them quite frankly sucked the chrome off a trailer hitch and were kind of embarrassing. It's always the figures you want to be rereleased that never do...or you end up waiting years for it to happen. Meh. Good thing some of us got these when they were first out, because there's no guarantee they'll ever see retail again. Imperial Navy Commander and Darth Malgus haven't turned up in the UK yet (neither has the deleted scenes wave) so I'm not scrambling around for those just yet. I really do want Bespin Han and ROTS Sidious but I'm not paying silly money for them. The Darth Malgus wave isn't out in the States yet either, but I and a small handful of other collectors have gotten our hands on the wave through toy shops, friends with connections and the like. Here's a photo of the Malgus wave I scored five days ago. I've posted it before but I don't know if you saw it or are aware of what the packaging on these new figures looks like. Quite a few people aren't. I must say, the artwork or photos on all five of these really impress me. The Darth Vader on a classic STAR WARS(ANH) cardfront really brings back a lot of memories from my early childhood. I have seen the deleted scene wave, but stupidly passed on them when I did. Of course, the next time I was there, they were gone. If I should see Malgus, though, that sucker's getting snatched up in an instant. 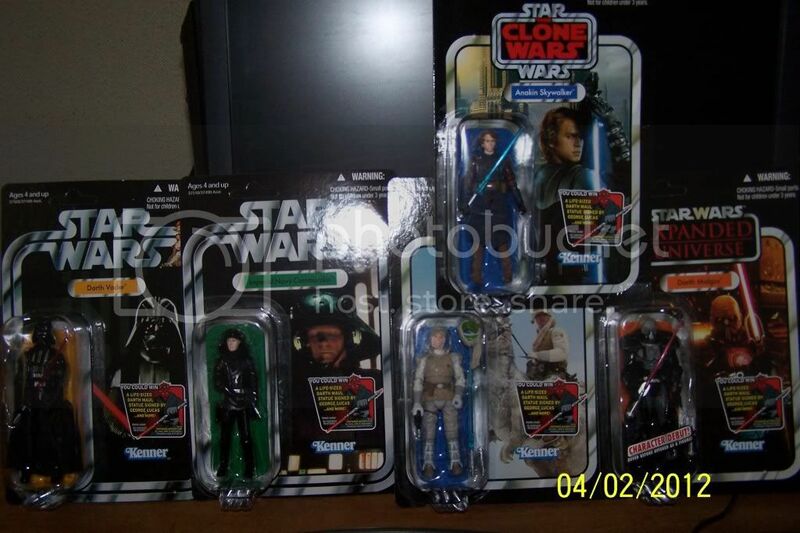 I haven't seen them together like that but I saw the packaging over at Rebelscum. Vader, Luke and Malgus are definites for me from this wave.